If you are headed to New York Comic Con this weekend, you'll be able to check out an exclusive set of Golden Girls action figures from Funko. 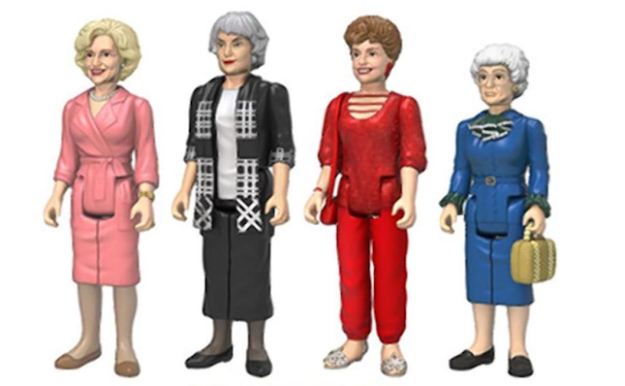 Rose, Dorothy, Blanche, and Sophia (with handbag) will be joining the ReAction figure 3.75-inch toyline, but exclusive only to the convention. In fact, there was a lottery process jsut to line up for Funko's booth so chances are slim to get this set. However, convention exclusives have been known to show up at Toys 'R Us and Hot Topic retailers so be on the lookout if you need these four matriarchs in your action figure collection. As a consolation, you can find Golden Girls POP! vinyl figures quite easily.